This section investigates how to migrate multi-tenant Rails applications to a Citus storage backend. We’ll use the activerecord-multi-tenant Ruby gem for easier scale-out. This Ruby gem has evolved from our experience working with customers scaling out their multi-tenant apps. It patches some restrictions that ActiveRecord and Rails currently have when it comes to automatic query building. It is based on the excellent acts_as_tenant library, and extends it for the particular use-case of a distributed multi-tenant database like Citus. In order to scale out a multi-tenant model, it’s essential you can locate all records that belong to a tenant quickly. The easiest way to achieve this is to simply add a tenant_id column (or “customer_id” column, etc) on every object that belongs to a tenant, and backfilling your existing data to have this column set correctly. Unique and foreign-key constraints on values other than the tenant_id will present a problem in any distributed system, since it’s difficult to make sure that no two nodes accept the same unique value. Enforcing the constraint would require expensive scans of the data across all nodes. To solve this problem, for the models which are logically related to a store (the tenant for our app), you should add store_id to the constraints, effectively scoping objects uniquely inside a given store. This helps add the concept of tenancy to your models, thereby making the multi-tenant system more robust. The activerecord-multi-tenant Ruby gem aims to make it easier to implement the above data changes in a typical Rails application. The library relies on the tenant id column to be present and non-null for all rows. However, it is often useful to have the library set the tenant id for new records, while backfilling missing tenant id values in existing records as a background task. This makes it easier to get started with activerecord-multi-tenant. Once you are ready to enforce tenancy, add a NOT NULL constraint to your tenant_id column and simply remove the initializer line. As mentioned in the beginning, by adding multi_tenant :customer annotations to your models, the library automatically takes care of including the tenant_id with all queries. Note the partition_key: :customer_id, something that’s added to Rails’ create_table by our library, which ensures that the primary key includes the tenant_id column, as well as create_distributed_table which enables Citus to scale out the data to multiple nodes. If the test suite for your Rails application uses the database_cleaner gem to reset the test database between runs, be sure to use the “truncation” strategy rather than “transaction.” We have seen occassional failures during transaction rollbacks in the tests. The database_cleaner documentation has instructions for changing the cleaning strategy. The easiest way to run a Citus cluster in continuous integration is by using the official Citus Docker containers. Here is how to do it on Circle CI in particular. Copy https://github.com/citusdata/docker/blob/master/docker-compose.yml into the Rails project, and name it citus-docker-compose.yml. Have your test suite connect to the database in Docker, which will be on localhost:5432. 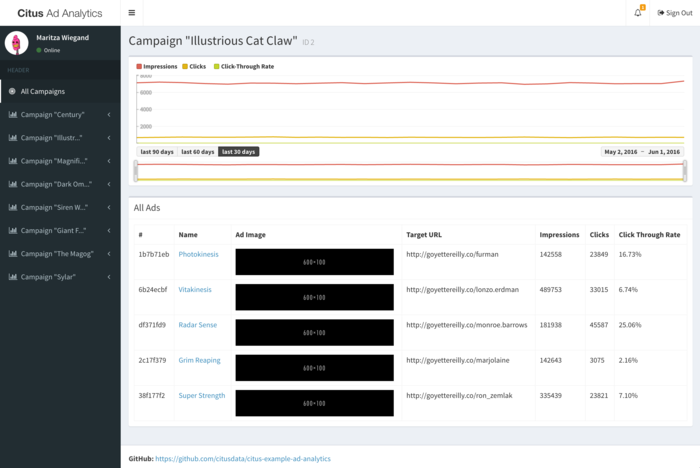 If you are interested in a more complete example, check out our reference app that showcases a simplified sample SaaS application for ad analytics.